The last remaining Dusky Seaside Sparrow died in 1989. Because of mosquito control to make life more pleasant for the engineers working on the Space program at Cape Kennedy, and the road-building and real estate development of 50 years, which has now resulted in massive mortgage foreclosures in Florida, we lost the Dusky Seaside Sparrow and the habitat it shared with an abundance and diversity of other species. We exchanged an earthly Eden for a now-blighted landscape, for nothing that was lasting or worthwhile, really, for no improvement upon what people found when they first arrived in Florida. This extinction was an avoidable and unnecessary loss. Within the context of the development pressures in Florida, the U.S. Fish and Wildlife Service bears great responsibility for much of the lost habitat. It failed to protect against habitat destruction by the county mosquito control agency; it did not prevent wetland drainage, even wetlands that were in public ownership, in two national wildlife refuges. It was illegal what happened. The U.S. Fish and Wildlife Service broke environmental laws! Legally, according to the Endangered Species Act, endangered species should be protected, receive priority. But they did not, even on federal refuge lands! And the refuge biologist hired to protect and preserve the habitat knew nothing of songbirds or how to manage their habitat. He was a good old southern boy who loved to hunt and fish. Despite his incompetence and his management failures, but he “fit in��� with dominant culture of the American South, and was rewarded with promotions to positions of even greater responsibility. By the time a competent and conscientious refuge manager was recruited in the 1980s who was willing to go to bat for the Dusky and its habitat against destructive development, it was too late. For further details, the complete case history of the extinction was reported in “A Shadow and a Song”, by Mark Jerome Walters, 1992, Chelsea Green Publishing Company, Vermont. Part of the following “epitaph”, which I wrote in 1989, after the death of the last remaining bird, was published in this book. “Imagine central Florida, between Cape Canaveral and Orlando, before there was Disneyworld, before rocket launchings and space shuttle disasters. A few miles inland the St Johns River meanders northward, following the coast, replenishing the moist grassland of its floodplain with flows and summer rains. It is dawn, not yet sunrise; the grassland is enclosed in morning mist; there is no horizon. Ghostly outlines of sabal palms are suspended in an atmosphere of grey softness. Black Rails are calling yet, “kiskadee, kiskadee.” Nightbirds. Offstage a Chuck-will’s Widow lapses into silence, last echoes of night. “Perceptibly the mist lifts and nature’s curtain rises: Scene II, daybreak. The first long level rays of sunlight illuminate (though they were there all along) a myriad sparkling spider webs bejewelled with dew, strung horizontal like hammocks between leaves of grass. Gray brightens into a sea of light green. A saltgrass meadow, a remnant of a Pleistocene sea, dotted pointilliste with marsh pinks, bespeckled with golden Coreopsis, stretches yellow, pink, and lime-green to the far horizon. “In the top of a tussock of grass on its sunward side, a small dark bird, feathers wet with dew, sits quietly, observant, incorporating the sun’s early warmth. Nearby, a faint song, tentative, the sound reabsorbed into the morning quiet. A pause, then the song again, more definite, a 2-noted “bzzt-szhreee”, the Dusky Seaside Sparrow’s announcement of night survived. The challenge provokes an answer, a song from another direction, then another. Songs soon everywhere, and morning has broken, like the first morning. “It is time to be up and about. There are affairs of state to attend to. First things first, breakfast can wait. Territorial claims made yesterday need reaffirmation; there are boundary adjustments and trespassings to be dealt with. Warmed and invigorated, a singing male ventures out on his first flight of the morning, a long low skimming over the tops of the salt grass, to a different song perch within his territory. To have and to hold. Other flights follow, pursuits, and escapes involving headlong plunges into the grass, the chases weaving patterns into the landscape. There are courtship displays accompanied by sweet soft intimate notes. There are mounting songflights into the air, expressions of extra exuberance. “This was spring in central Florida, when Dusky Seaside Sparrows were “at play in the fields of the lord”, while all around the salt grass meadow, dotted with palm trees and pink and yellow, stretched lime-green and vibrant to the far horizon. “Fifteen years later, of the several thousand seaside sparrows once alive on Merritt Island near Cape Canaveral, and of the several hundred pairs I discovered along the St Johns River on the mainland, none are left. On the island, which became the Merritt Island National Wildlife Refuge in 1963, the salt meadows had been treated with DDT and other insecticides from the mid-1940s to the early 1960s, reducing the seaside sparrow population by a estimated 70%. 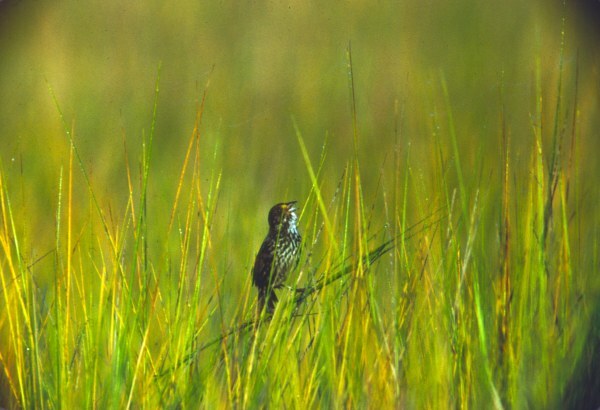 Since 1962, all of the seaside sparrows’ salt marsh habitat was diked and flooded for mosquito control, and the all-important salt marshes were drowned out, and no seaside sparrows were seen after 1977. They were driven to extinction on the refuge. The score: mosquito control 1, Dusky Seaside Sparrow 0. “On the mainland, a new a little used superhighway conducts the unwitting tourist between the fantasy of Disneyworld to NASA’s Space Center on the coast. The Eden on earth that lay between, home not only to endangered Dusky Seaside Sparrows, but other wonders, such as Amaryllis lily, lizards of glass, alligators, foot-long salamanders they call sirens, indigo snakes also endangered and 8 feet in length, was rent and torn and bulldozed out of the way. Ditches drained the moist meadows, siphoning away the water, their lifeblood, the sine qua non of their existence. Ditches that should have, could easily have been plugged. Invading brush and fire destroyed the mainland within a decade, while the bureaucracies looked merely on. “There are no Dusky Seaside Sparrows left in nature. One caged males spent its old age as a non-paying guest in a cage at Disneyworld. Out of place. Pensioned off. The corporate version of responsibility—it was the most, the least, they could do. There were no females. A perhaps valiant but vain attempt was made to preserve the Dusky Seaside Sparrow genetic difference in a handful of hybrid offspring. But it was too little too late. The Dusky Seaside Sparrow was ecologically, functionally, extinct. “Act III, the third and final act. Now you are the sole survivor, the last of your line. Hanging onto existence by a thread. Your days are numbered. It has been suggested that you might not be missed. It is like thinking that a necklace would never miss one of its pearls, or a song one of its notes. It is written that not a sparrow falls unnoticed. This epitaphs is our noticing. Neither this spring, no ever again, will your exuberant perforances appear on nature’s staged. Your passing is a tribute to progress, a measure of our own inordinate if temporary success as a species. But our success is also our loss, and your loss is our world and ourselves diminished. And except for this account of the days of your prosperity, or the extent of our impoverishment we will hardly even have been aware.